In the Bible it says Sarah was possessed by a demon – we tend to say she was someone with lots of bad luck!!!! We think it’s enough for the younger children to concentrate on healing using the fish; the Juniors could look at the fuller story, understanding more about journey and revelation. There is a large framed print of Raphael and Tobias in the main administration corridor; the original hangs in the National Gallery. 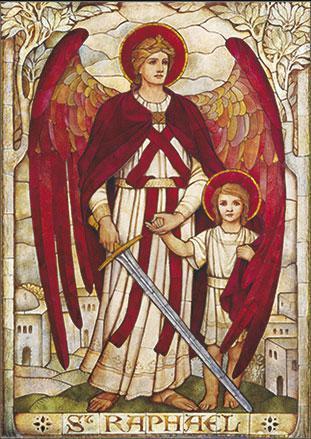 The school celebrates the Feast of St Raphael on September 29th, the Feast of the angels Michael, Raphael and Gabriel.